Sr. Teresa Maya, CCVI (center), shares a photo with her councilors (pictured L-R) Sr. Bertha Flores, Sr. Jean Durel, Sr. Gloria Ortiz and Sr. Margaret Snyder at the installation of the new leadership team in the Chapel of the Incarnate Word. On July 13, the founders of the University of the Incarnate Word (UIW) and CHRISTUS Santa Rosa Health System, the Sisters of Charity of the Incarnate Word, celebrated the official installation of their 18th General Leadership Team at the Chapel of the Incarnate Word. 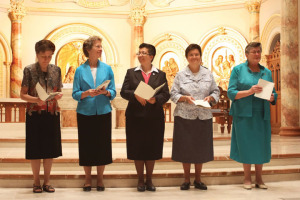 Five Sisters were installed to lead the congregation, including Sr. Teresa Maya, CCVI; Sr. Bertha Flores, CCVI; Sr. Gloria Ortiz, CCVI; Sr. Margaret Snyder, CCVI; and Sr. Jean Durel, CCVI. Sr. Teresa, a member of the order for 20 years, was confirmed as the congregational leader and is the second Latina to be elected to lead the Sisters since their founding 145 years ago. 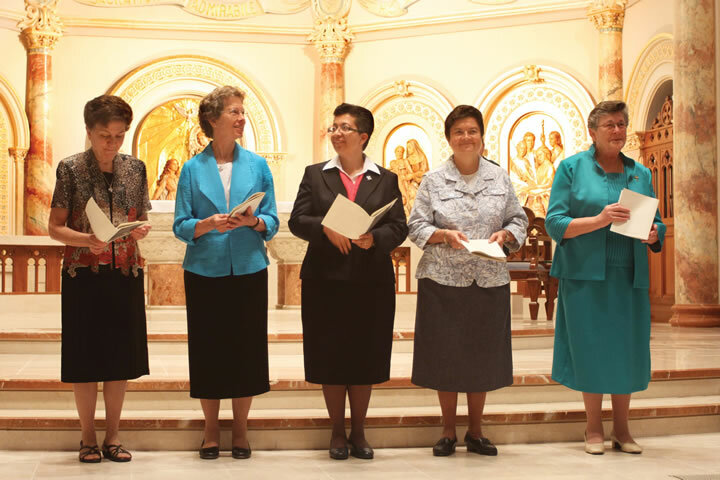 She will lead the more than 300 members of the order, which has Sisters throughout the United States and in Zambia, Peru, Guatemala, Mexico and Ireland. The new leadership team will serve a term of four years. Visit http://www.amormeus.org/ for more information about the Sisters of Charity of the Incarnate Word.